Developer: Barry Real Estate Cos. 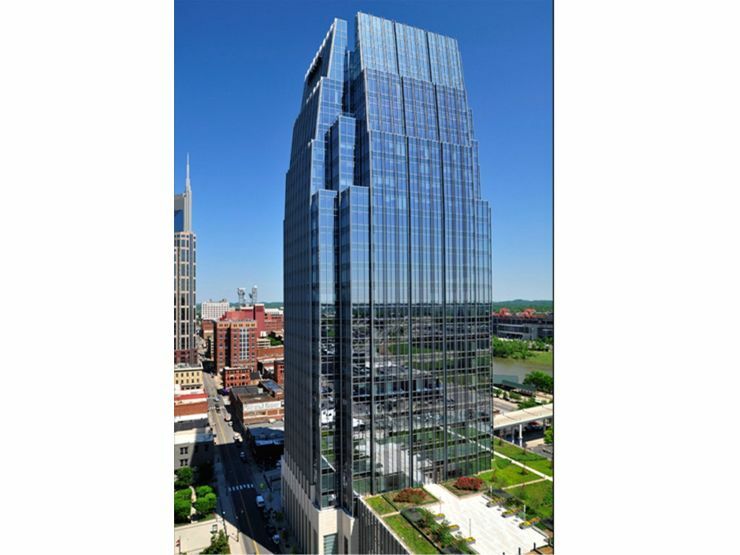 Located adjacent to the Schermerhorn Symphony Center in Nashville, Tennessee, The Pinnacle at Symphony Place is a 29-story, 500,431 sf luxury office and retail skyscraper in the city's SoBro (South of Broadway) district. The $170 million Pinnacle is the city's only Class AA office tower and first LEED Gold certified skyscraper, and the primary business address for the city's top corporations; it is one of very few office towers in the Southeast with no interior columns. "The Tower entrances of highly articulated stone, metal, and glass convey their durability while acknowledging the building distinguished neighbor, the Schermerhorn Symphony Center. At twenty-six stories, with the timeless design of classic skyscrapers, the building respects the neighborhood intimate scale while offering twenty-three floors of office space to large firms, atop a six-story podium comprising retail, restaurants and a ten-level parking garage. As the first LEED-CS Gold certified building in the State of Tennessee, the Pinnacle incorporates numerous sustainable design features such as low-E glass and a greenroof, located over the parking garage at level seven, landscaped with native plants to absorb heat and rain water and to provide a pleasant retreat for tower occupants," (Pickard Chilton). 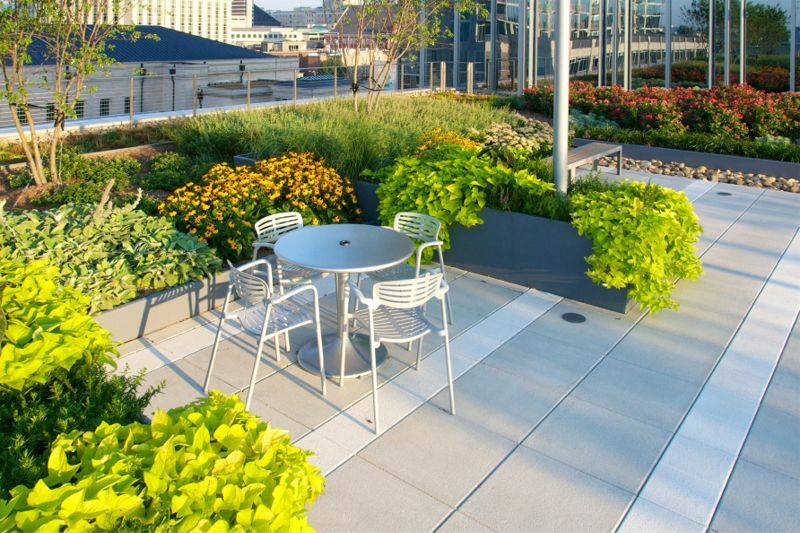 Providing a luscious expanse of nature for use by The Pinnacle tenants, their employees and guests, the one-acre roof terrace garden offers stunning views of the river and downtown Nashville. The greenroof can seat up to 300 for an out-of-doors event, and a custom made tented enclosure is available for special events. Although the building officially opened on February 10, 2010, the greenroof was installed in July of 2009. 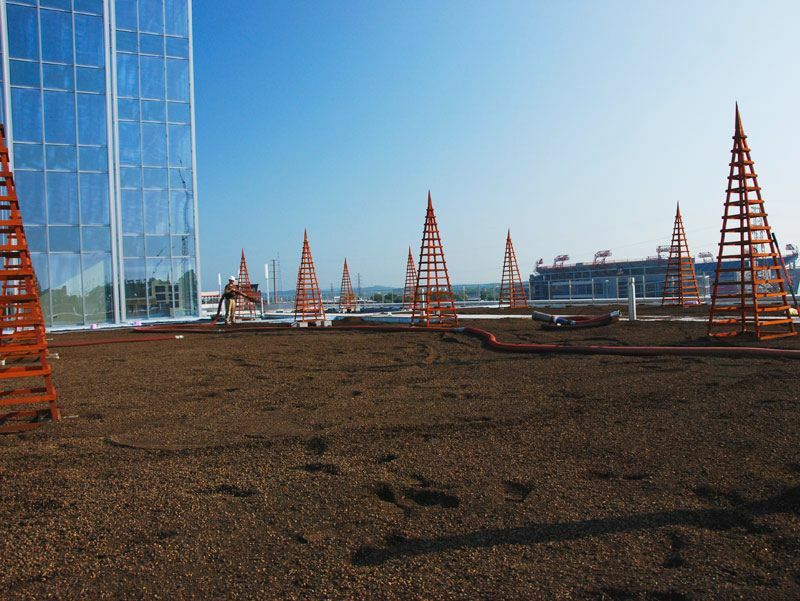 Hawkins Partners (HPI), a Nashville based firm, provided landscape architectural services for The Pinnacle. 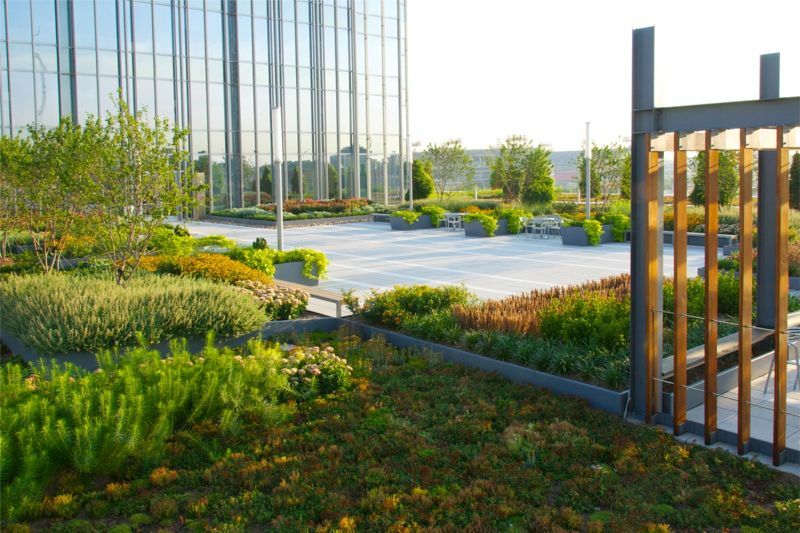 HPI was responsible for the 29,000 SF greenroof designed with plenty of gathering areas. engineers Smith Seckman Reid, and LEED consultants BVM Engineering. Property management is provided by Highwoods Properties. The Pinnacle at Symphony Place not only enhances Nashville's skyline, it affords tenants a spectacular 360 degree view of the city and the surrounding hills. The Pinnacle at Symphony Place is located at 150 3rd Ave S, Nashville, TN 37201; 615.986.7810; visit their website and their Green page where you can also see a slideshow. Visit their Gallery to see more photos; download The PinnacleLEED Fact Sheet, and Full Brochure. Thank you to the property management team at Highwoods Properties who provided profile photos, as well as by Greenrise Technologies and Hawkins Partners (hover over each to see the credits). Watch the 2:17 video The Pinnacle at Symphony Place - Project of the Week 4/21/14 from Greenroofs.com on the greenroofsTV channel on YouTube. See the project profiles from Pickard Chilton; Hawkins Partners; and Greenrise Technologies. For more info, contact Scott King of ERTH Products at: 770-487-6677 or scottking@erthproducts.com.